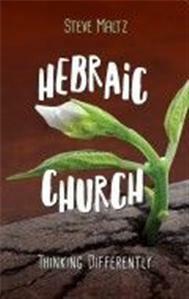 Hebraic Church? Now there's a phrase designed to upset or confuse just about everyone! Yet being Hebraic is not what many in the Church imagine it to be. In fact it could be nothing less than the key for true restoration and revival. The Author develops the theme that the failure of so many Church initiatives to get 'back to basics' is because doing things differently can't be sustained unless there is a corresponding move to think differently. There's no way we can take a Hebraic model (of the early Church) and get it to work in a 21st century culture where the Greek model still reigns supreme. With his customary humour, pacey style and shrewd insights, Steve Maltz examines seven areas where the Church has gone askew and suggests practical solutions to re-align the modern Church with its 'original model'.